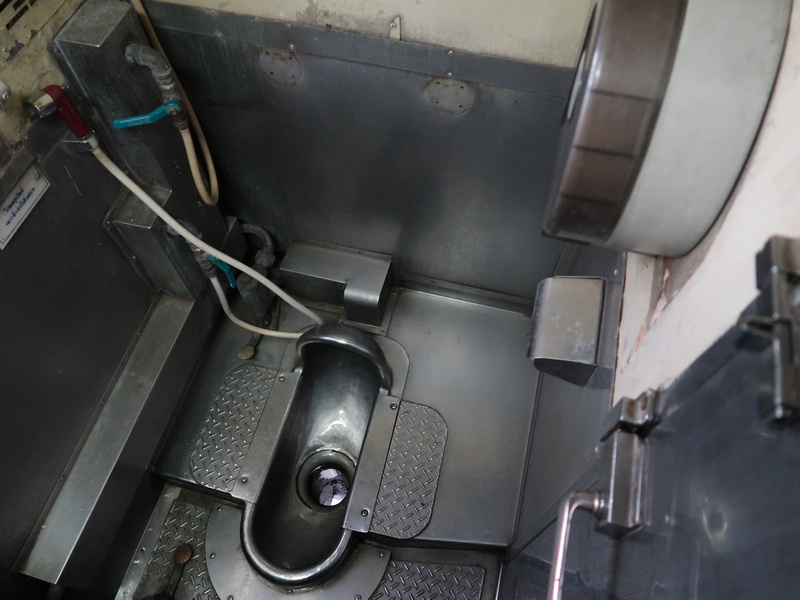 The train from Bangkok to Chiang Mai is a great way to travel between the two cities, but depending on your travels it’s not always the best way. With some planning by picking the right trains you can save money and see some of the highlights of Thailand. 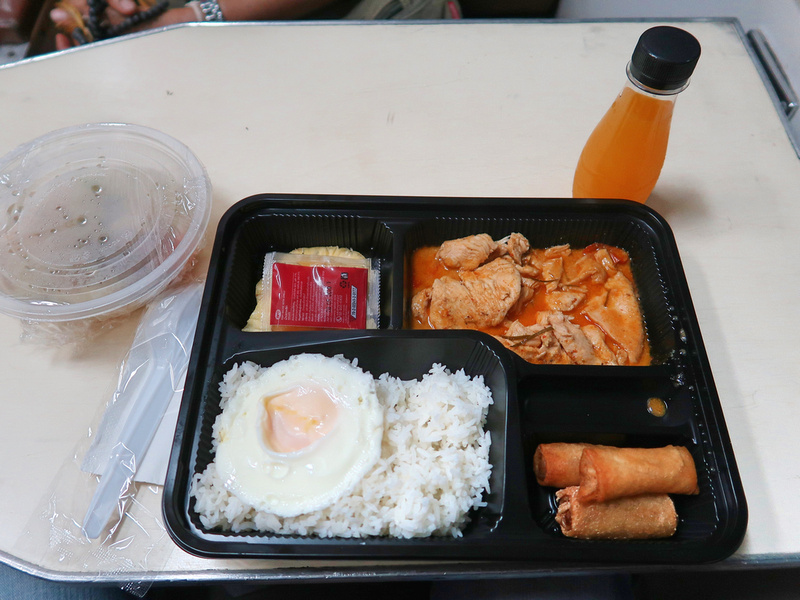 Bangkok to Chiang Mai – train, bus, or plane? If you’re not familiar with railways in Southeast Asia then you would naturally guess that the train would be faster than a bus. In this case the bus is the cheapest and fastest land option. The bus takes about 10-11 hours, while the train takes anywhere from 10 to 14 hours. Trains in Thailand run on old metre-gauge tracks (compared to the wider standard-gauge of Europe and China). Many of the routes are also single tracked, so trains from opposing directions share the same line, waiting at designated passing loops. Before the age of low cost airlines the bus was always the cheapest option. These days there are so many flights between Chiang Mai and Bangkok that you can often find a flight almost as cheap as a bus. For example I booked a flight from Chiang Mai to Bangkok for $37, which was booked 5 days before flying. Getting the overnight train works out cheaper than a bus when you consider that you are saving a night of accommodation expenses. The day train is best if you stop at destinations along the way, rather than going straight through. If you just want the absolutely cheapest way then get the bus. If you want the most convenient way, get a flight. And if you are visiting Thailand and want to see some of the highlights of central and northern Thailand then get the train. The first time I went to Chiang Mai I got day trains over multiple days, then got a night train back. 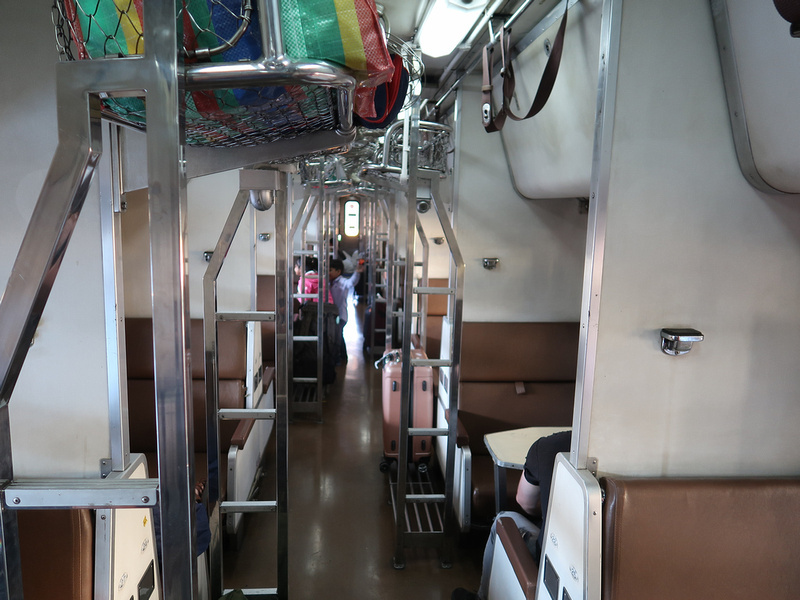 The day train allows you to travel in comfort while being able to see some of the most important historical sites in Thailand. 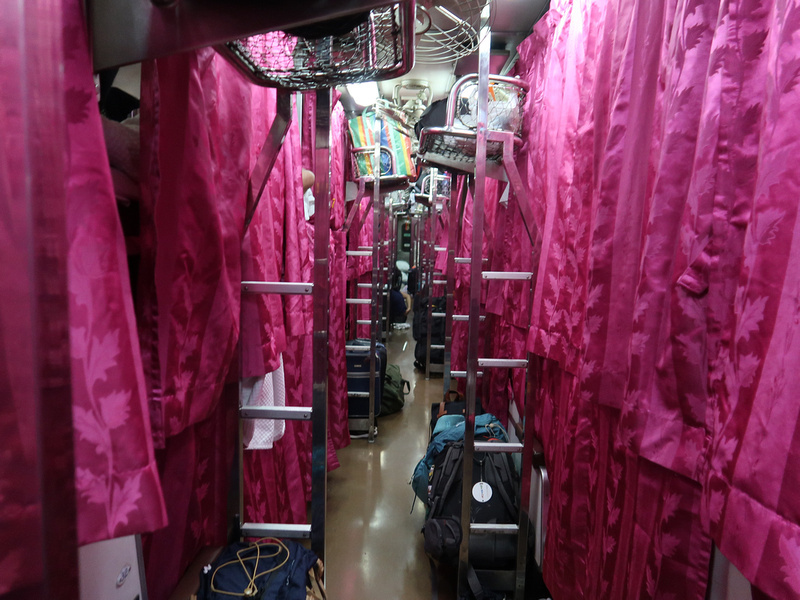 The night train is a fun experience in itself, and it will save you a night in a hotel/hostel. 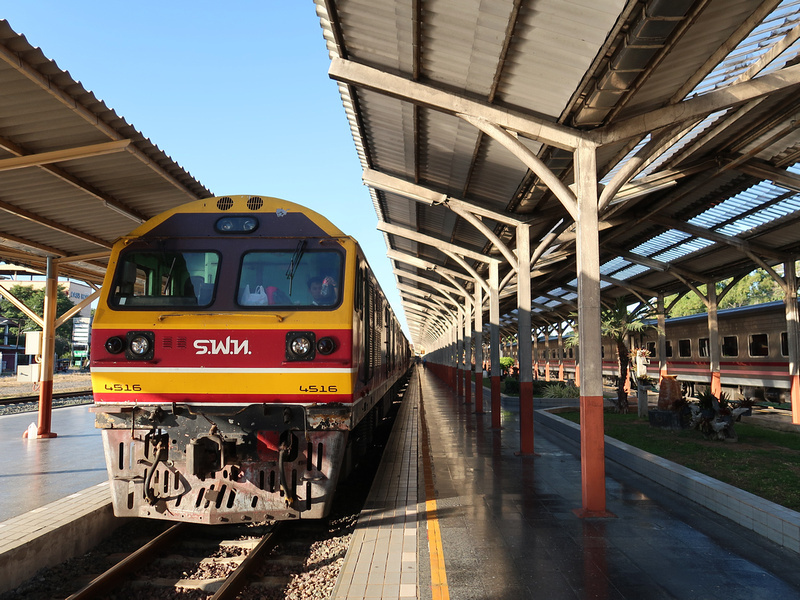 If you’re also planning to visit the south of Thailand, then get the train north and fly from Chiang Mai to your southern destination (saving you a back-track to Bangkok). 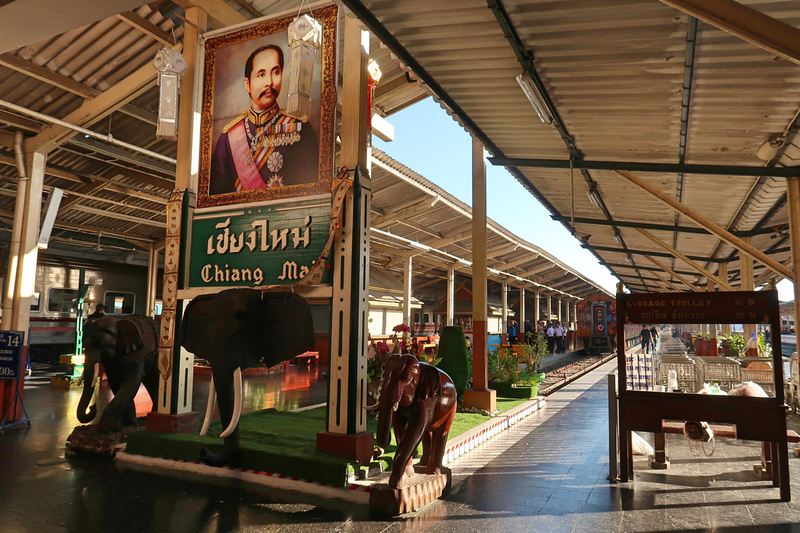 These are the itineraries I recommend for the day train from Bangkok to Chiang Mai. This breaks the trip up into a minimum of four travel days, taking in the historical ruins of Ayutthaya, Lopburi (the city of monkeys), and Phitsanulok for the Sukhothai Historical Park (capital of the first kingdom of Siam). 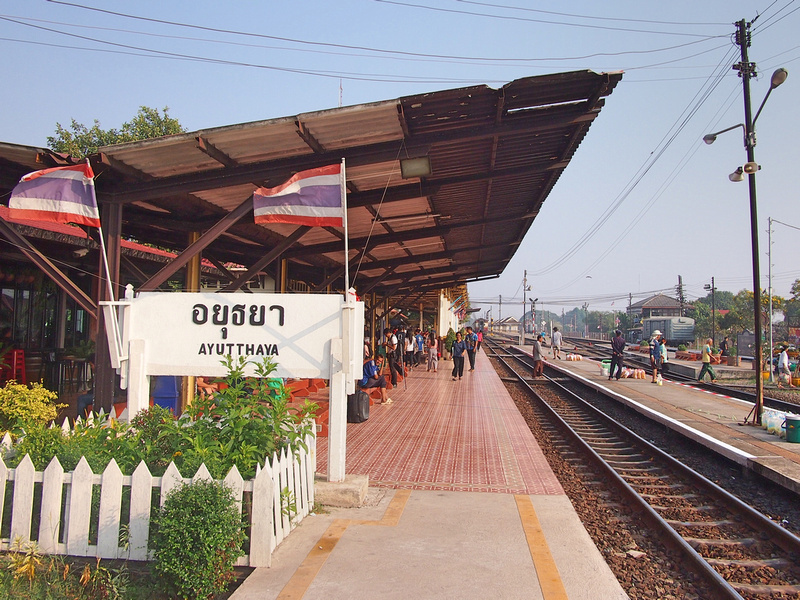 For Bangkok – Ayutthaya and Ayutthaya – Lopburi there are numerous commuter trains throughout the day where you can just turn up and ride. The cheapest seats are third class, which may be standing room only. Consider it part of the Thai travel experience. For Lopburi – Phitsanulok and Phitsanulok – Chiang Mai I would book the seats in advance to make sure you get a seat. You will need a full day in Phitsanulok to see the ruins of Sukhothai. Doing the same trip from north to south, here are the best day trains. I’m a frequent visitor to Chiang Mai so these days I usually fly to or from Bangkok. It had been a few years since I took the train so I thought I should ride the train again for review purposes as part of my project on Southeast Asia railways. I booked Train 14, leaving Chiang Mai at 17:00 and arriving in Bangkok at 6:15 (a 13h 15m trip). I booked a second class sleeper seat with a lower berth. Get a lower berth if you are tall or have problems climbing a bunk. The seats are a bit weird to sit on as they don’t recline. You’ll only be sitting on them for a short while before they are converted into beds. 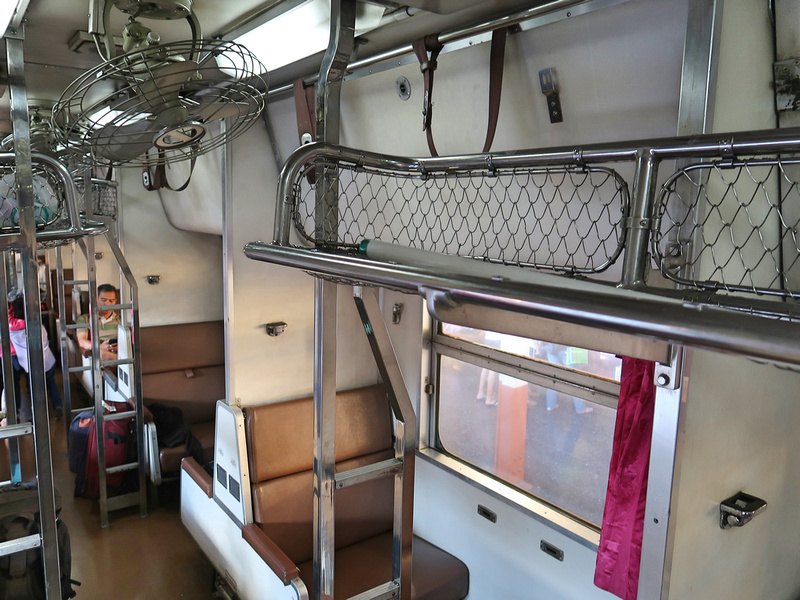 Thai Railways have been upgrading carriages, so the days of the old carriages might be over soon. I got one of the new trains from Bangkok to Nong Khai. 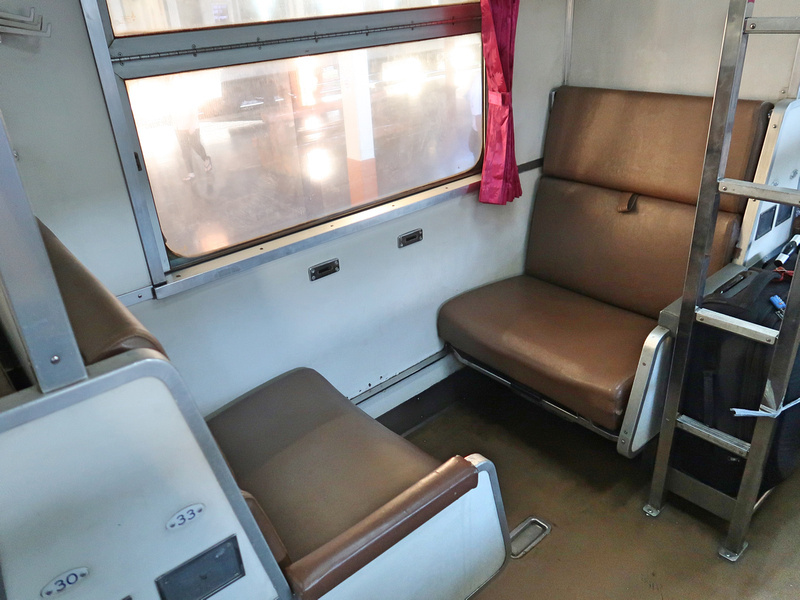 While the modern trains have better amenities, old trains are comfortable and a link to a soon-to-be bygone era. You will not see modern trains with ceiling fans like this. 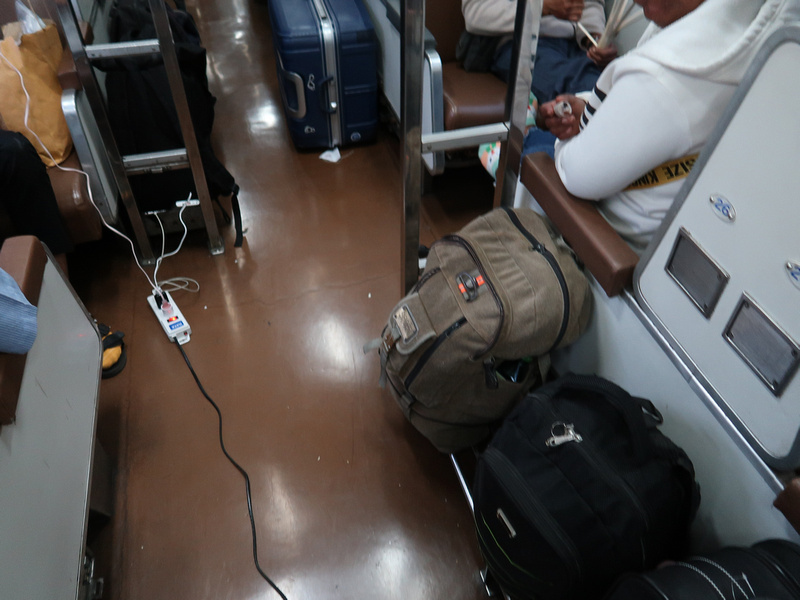 Being an older train they aren’t built for modern times where everyone has devices that need daily charging. I got lucky as there was a power outlet next to my bed. The new trains have a power outlet for each bed. This traveller had come prepared with a power board. 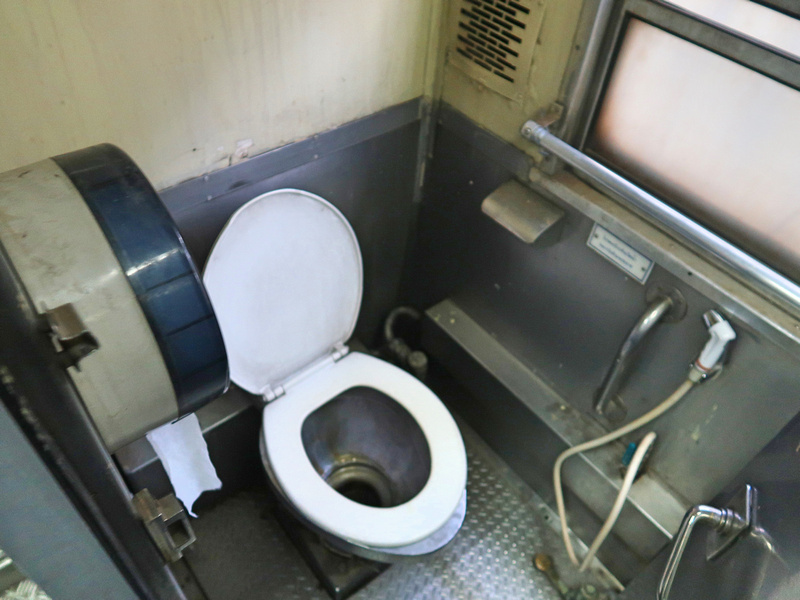 The toilets are like the old trains in Europe that flush onto the tracks. There’s also the squat toilet option, if that’s your style. There is a dinner service where a waiter comes through and takes orders. 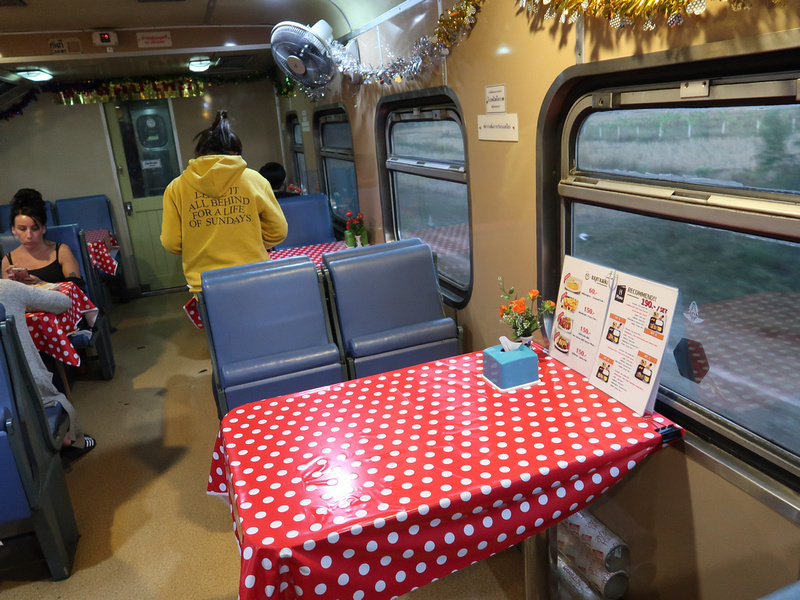 Dinner is served at your seat with an extendable table, otherwise you can eat in the dining carriage. About an hour after departing attendants work their way through the carriages converting the seats into beds. The two seats fold out to form a bed, and a bunk bed is then folded down. The beds are comfortable, though if you are tall you won’t be able to lie straight. I’m 6’1” and I had to lie at an angle. I can’t sleep on flights, and I’m not much better on trains. I was looking forward to this trip knowing it would be like a reading holiday. I might have got a couple of hours sleep. About an hour out of Bangkok the attendants come though and start folding up the beds. The train stops at Don Muang for the airport, so this is a good option if your flight is mid-morning. I probably wouldn’t risk it if my flight was early, given that the trains are known to run late. 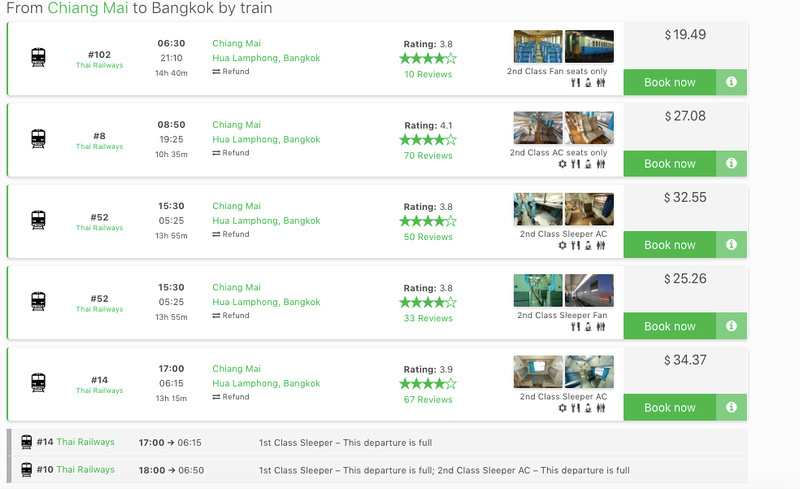 For train tickets in Thailand I use 12go.asia for tickets that need to be booked in advance. 12go.asia are Southeast Asia travel specialists, and the site compares trains, buses, and flights. 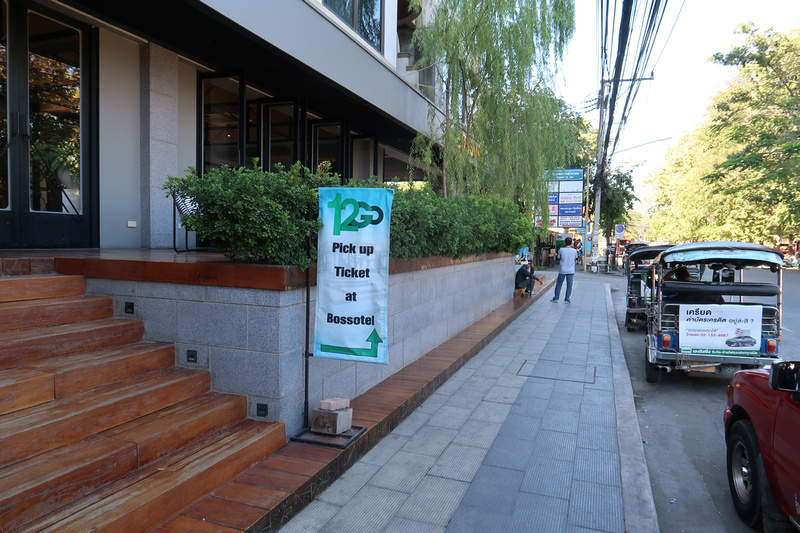 To pick up your tickets in Chiang Mai there is a pick-up point at the Bossotel, opposite the railway station. Tickets can be picked up on the day of departure. Bring your booking conformation and passport. My Chiang Mai – Bangkok ticket. 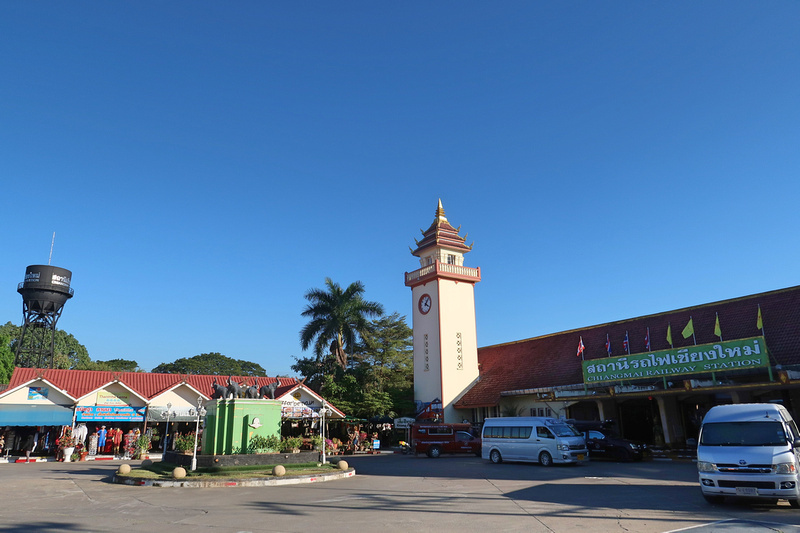 There have been different plans over the years to improve the railway service that connects northern Thailand. With such a large volume of travel between Bangkok and Chiang Mai there needs to be a faster service. The distance between the two cites is 754.4 KM, and depending on the train you get the journey time varies from 10h 35m to 14h 40m. That makes an average speed of 51 to 71 km/h. By comparison a regional or intercity train in Europe is around 160kn/h, which would make the journey in 4h 42m. There has been a proposal to built a Shinkansen-style bullet train. Japan had offered to build it, though it would be prohibitively expensive to do so. A more sensible option would be for a medium-speed railway that runs at 180-200 kilometres per hour. Trains at that speed would have to be built on a standard gauge, which would mean a completely new railway line over the current metre-gauge line. 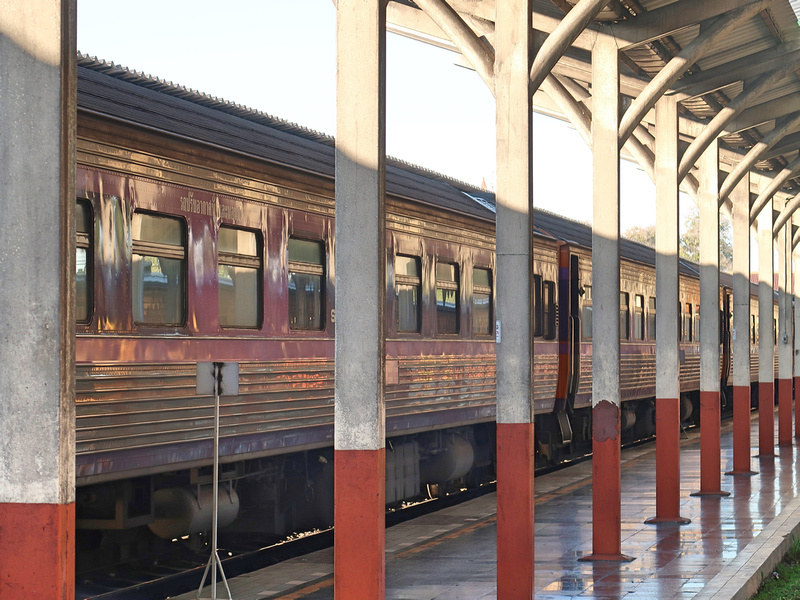 Read more about the future of Thai railways at current and proposed railways of Southeast Asia. Wow! looks like an amazing journey. Loved it. I love traveling by train from childhood. Thanks for sharing this information. Reminds me of our 3 pax trip recently. 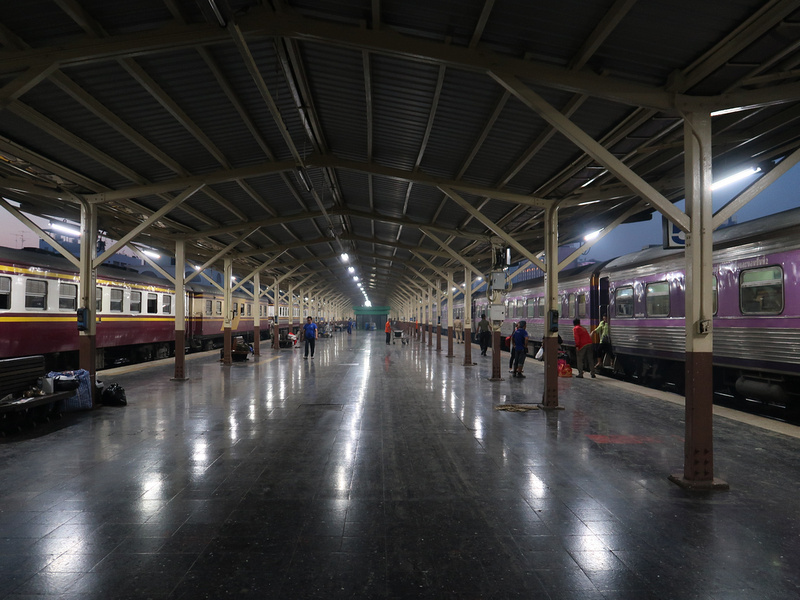 We caught the day trains from Lampang to Phitsanulok for 5 nights then on to Ayuttaya for another 3 – buses bookended the trains. A fantastic way to travel when time allows.